How the Sultan of Swat got in trouble when a little girl recited a poem. The best baseball player of all time enjoyed a good time. Babe Ruth drove fast, drank himself silly and appreciated the company of women other than his wife. So it’s perhaps no surprise that he got arrested on suspicion of engaging in illegal behavior during a jaunt to sunny San Diego. What’d he do? Well … he allowed an 8-year-old girl to recite a poem during a stage performance in a downtown theater. We’re not kidding. A bewildered judge balked at the charges, and George Herman “Babe” Ruth Jr. never had to spend a day behind bars. But there’s a lot more to the story, as I discovered while taking a look back during this World Series week. It features a left-leaning labor commissioner, baseball-tinged baseball and, in a supporting role, the Sultan of Swat’s appreciation of politically incorrect seafood. The tale unfolds in baseball writer Jane Leavy’s widely praised new biography “The Big Fella: Babe Ruth and the World He Created,” which chronicles how the home run king produced a new kind of celebrity. Ruth swept in town Jan. 10, 1927, for a week’s stay, including appearances at the grand, now-demolished Pantages Theater at Fifth and B in downtown. For just 25 cents, locals could see him on a bill along with vaudeville acts, including Bishop & McKenzie (no, not a law firm) and the mysteriously named “Ernest Evans & 1927 Ripples.” A movie would be shown too: a romantic silent flick called “Love’s Blindness” that’s lost today. 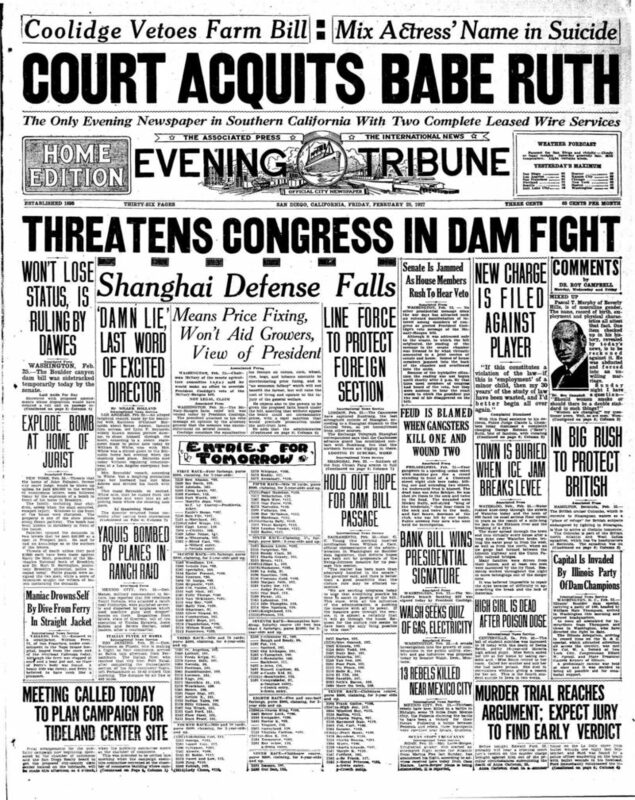 The Evening Tribune devoted nearly an entire page to touting Ruth’s shows, and a local dairy bought an ad reminding readers that “the world’s greatest swatter” drank five quarts of whole milk a day. Men and boys, it suggested, should really quaff a quart. Ruth charmed local newspapermen by raving about San Diego. “Call this winter?” he declared as he posed in a bathing suit for photos at the Hotel Del Coronado. He planned to golf, hunt and fish. 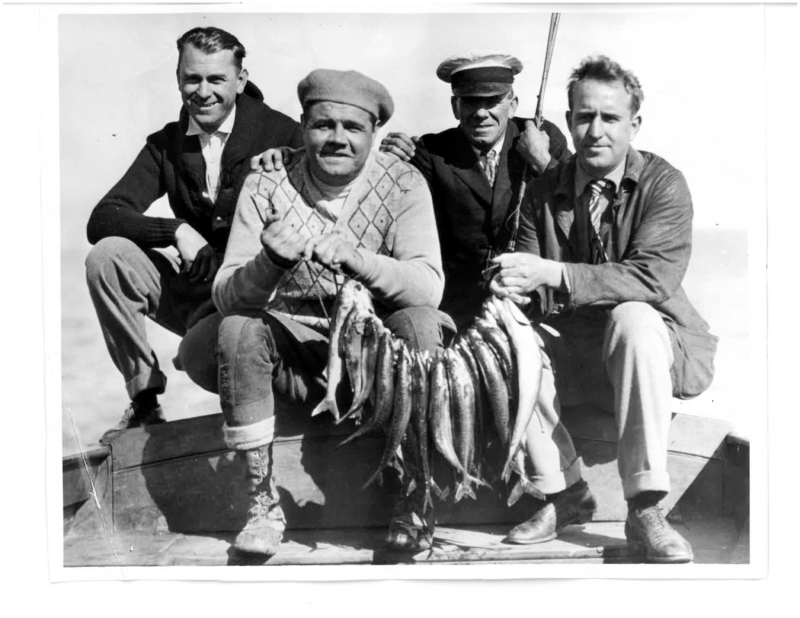 (According to Leavy, he had an affinity for the unfortunately named “jewfish,” which is better known these days as black sea bass). Ruth also engaged in a less-reputable activity: boozing it up during Prohibition in a town where a bootlegging scandal would ensnare City Hall just two years later. The granddaughters of one of Ruth’s San Diego pals “told me that it was well-known family lore that he’d come over to dinner and enjoy some of the bathtub gin that was put aside,” Leavy said. But it wasn’t adult beverages that got Ruth in hot water. It was Baby Annette. On Jan. 14, one of those kids was an 8-year-old child movie actress named Baby Annette, who recited a poem. Eight days later, as he visited Long Beach, Ruth learned that he’d been indicted by a San Diego deputy state labor commissioner named Stanley M. Gue on charges of violating labor law. Specifically, Ruth hadn’t gotten a permit to put Baby Annette to work — never mind that she only got a baseball out of the deal — and he’d kept her out after curfew. Indeed, years earlier, he’d been secretary of a local chapter of the leftist union known as Industrial Workers of the World — the Wobblies. This was around the time of San Diego’s infamous 1912-1913 Free Speech Fight, when the city leaders targeted the Wobblies with violence, vigilantism and a brazen attack on constitutional rights. The labor commissioner “also had an eye for PR,” Leavy said. And he got it. Ruth’s arrest was big news, although it couldn’t have come as a shock to Baby Annette or her parents. According to The San Diego Union, the labor commissioner had previously prosecuted the managers of theaters where she performed, and he’d gone after her parents over missing permits. He added that 98 of cases were handled “privately in my office.” The newspaper story didn’t mention one big exception: The Big Fella. Jane Leavy, author of “The Big Fella: Babe Ruth and the World He Created,” will speak at a free event on Nov. 8 at the San Diego Central Library. For details, click here.